Still stumped by which Halloween decorations to use for your upcoming party? How's this for a Halloween craft? 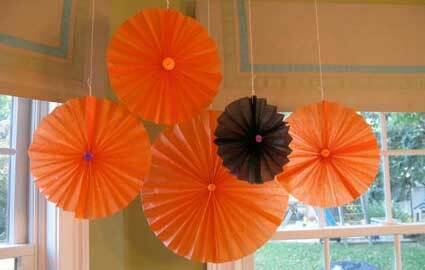 Try these easy-to-make folded paper ornaments. They'll add some spark to the corner of a room, over a party table or on a covered porch. They're so simple to do, just think back to your kindergarten days and get folding. 1. Measure, mark and cut two equally-sized rectangles from paper. Accordian fold each like a fan, trying to keep each fold the same width. Trim excess at end. 2. 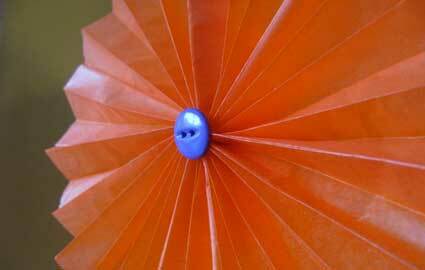 Fold pleated paper fan in half. Staple at the center point of each fan. 3. Glue folds of fan together where they meet in the center. Then, glue the first fan to the second fan along each edge. 4. Punch a hole in one pleat along outside edge and tie a long string to hang ornament. If desired hot glue a colored button at the center. 5. Vary the sizes and colors of each rectangle to create a mixed grouping. Think about using patterned paper (lightweight works best) as well as making a scalloped-edge, by trimming the square ends into a rounded shape.